Whew! The past two months have been a whirlwind—on-tour with appearances, conferences, and interviews, first in Pennsylvania, North Carolina and Texas, then following 10 days rest in Tucson—on to California, Oregon, Washington, BC, and Michigan. Now back in the San Francisco Bay area, I’ve been resting up as I contemplate what might come next. An account of my eastern tour was included in my October message, so I’ll begin with a brief report on The Economics of Peace conference (http://www.economicsofpeace.net/) that was held in Sonoma, California during the fourth week in October. I was one of the featured speakers at that conference, presenting an illustrated talk titled, The Economics of Peace, Justice and Sustainability: Toward a New Convivial World Order. The conference was one of the best I’ve ever attended, with regard to not only the program but the organization and the setting, as well. Praxis Peace Institute Director, Georgia Kelly informs us that videos of The Economics of Peace conference are for now being uploaded to the Vimeo website http://vimeo.com/channels/theeconomicsofpeace. Among those available for immediate viewing are the presentations of Vandana Shiva, A. T. Ariyaratne, and David Korten. Later, the presentations will all be on the Praxis Peace home website http://www.praxispeace.org/. DVDs and audio CDs will also be available sometime in December. While in the Bay area, I also gave a presentation at San Francisco State University. This was at the invitation of long-time correspondent and friend Kenn Burrows who teaches in the department of Holistic Health Studies. Noticing a two week gap between my California and Michigan commitments, Brian Allen offered to organize a tour of the Northwest. After deliberating about the pros and cons, I agreed to take him up on it. It turned out to be a very interesting and productive tour, with Brian skillfully handling the details every step of the way. In Portland I worked with the Community Exchange Network (CEN/PDX) currency organizing group, putting on a workshop for them on Saturday, then on Monday afternoon we gave a presentation to city officials, among them, the Mayor’s economic development policy advisor. Adding a bit more substance to our presentation was William Underwood, organizer of a successful rebate program called Locals Care that has been operating in northern New Mexico for the past three years (https://www.locals-care.com/lcindex.php). That program has worked out some of the operational details associated with accessing existing payments infrastructure for use of with alternative currency. The capstone of my Portland visit was a public lecture I gave on Monday night at the Unitarian church, which was well attended and successful in a variety of ways. The Portland people, like those in Asheville, inspired me with their dedication, commitment and intelligence. I’ve agreed to be on their advisory board. In Seattle, I enjoyed the hospitality of the Ramer family, which afforded an opportunity for me to get a deeper understanding and an update on the Interra rebate project which Jon Ramer, with Greg Steltenpohl, helped to organize (http://www.interraproject.org/). That project utilized existing card reader technology and point of sale devices, but at rather high cost. If a greater scale of operation can be reached, the overhead might be bearable. 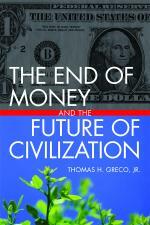 On Wednesday evening (Nov. 4), I gave a lecture on The End of Money and the Future of Civilization at the landmark Elliott Bay Bookstore. That presentation was video-recorded by Todd Boyle who has done a great job of merging the slide graphics with the video to create a movie that has been posted on vimeo. I’ve also added a link to it on my blog http://beyondmoney.net (in the sidebar to the right under My Audio-visual Presentations). Taking a leisurely drive up the coast on November 5 with Brian and Carolyn, we arrived around dusk at the border crossing into Canada. I remember the days when going into Canada was almost as easy as crossing the street. Now, one needs to show a passport and submit to sometimes intensive interrogation and searches. Still, we managed to reach the dock at Tsawassen just in time to catch the last ferry to Salt Spring Island. Salt Spring Island dollars were launched eight years ago. The nicely-designed notes, which are sold for cash, have had some success in raising funds for local charities but they have not circulated widely on the island. Many tourists acquire the notes and take them home as souvenirs. The Board members are now seeking ways to make their currency more meaningful to island businesses and residents. In my meetings with them, and in my public presentation, I proposed that they change the method of issuance to monetize the local value-added by Island businesses, preferably within a mutual credit clearing association, as I’ve outlined in my recent book. That message seems to have been well received and I’m hopeful that the Salt Spring Island local exchange project may soon evolve into a good model for other communities to follow. Upon returning to the U.S., I gave presentations on both Whidbey Island and Vashon Island. Whidbey has recently launched a currency and Vashon people are considering one. In both cases, I stressed the importance of scale and of starting by recruiting “trusted issuers,” i.e., the popular businesses in the community where everyone wants to shop. These are the members that should be first to have the overdraft privilege (lines of credit) that allows them to spend before they earn. Individual members should initially be required to earn before they spend. On Whidbey, I gave a presentation at the Whidbey Institute and had substantive discussions with the founders of the currency project. On Vashon, I was the guest of the Vashon Co-housing community. The talk I gave at the Red Bicycle Café was imbedded in an evening of enlightenment and entertainment that included songs sung and played by a local entertainer, a different kind of format that everyone seemed pleased with. The final stop on the tour was Traverse City, Michigan where I was a presenter at the Conference on Michigan’s Future Energy, Economy & Environment (Nov. 13-15, 2009, http://futuremichigan.org/). My presentation on the first day of the conference (Friday) was billed as “Why the Economy is Collapsing.” My coverage of that topic was contained in my slide show that I titled, The Economy: How Did we Get Here and Where are we Going? My second presentation (Sunday afternoon) provided a more detailed outline of how to design, manage, and issue complementary credits or currencies. The listed title was “Local currencies and credit currencies,” but I ended up calling it The Exchange Revolution: Taking Cashless trading to a new level. The narrative (MP3) and slide show (pptx) for each of these presentations are currently posted separately at http://www.mediafire.com/?sharekey=b3d291f68f7542fdab1eab3e9fa335ca80431dd425797f76 (files 140 and 141, and 595 and 596, respectively). You can download a free Power Point viewer for pptx files from the Microsoft website. At the end of my stay in Traverse City, I met with the Board of the Bay Bucks local currency project, two members of which are old friends from the Bioregional gatherings of the 1980s. They, too, are looking for ways to make their currency more significant to their local economy. I offered them the same advice I gave to the others—show the most popular businesses in town the advantages of spending their own currency jointly into circulation. With a little seed money, Traverse City could become another good model for community exchange. I could give lots of interesting details on all of these experiences but for the sake of brevity I’ll refrain. My main priority at this point is to show alternative exchange entrepreneurs in both the grassroots and for-profit realms where the real liberating power lies. It’s in reclaiming the credit commons by monetizing the value-added by local industries, farms, and other businesses. What that means is organizing the productive enterprises in a community to pool their credit and to allocate it to one another in proportion to each business’s ability to provide valuable goods and services to their community. This is accomplished by their participation in mutual credit clearing exchanges and/or by jointly issuing a local currency and spending it into circulation. It can also be accomplished by participation in well-managed commercial “barter” exchanges. I’m encouraged to see that this approach is increasingly understood and gaining ever greater traction. Several promising projects are either nearing launch or are shifting over from less empowering designs. There is an urgent need now for (1) grant funding or investment capital to build optimal exchange models that can be quickly scaled-up and replicated, and (2) a “space” for collaboration where developing exchange projects can learn from and assist each other. We don’t have time to reinvent any wheels. Solutions that have already been worked out and tested in one place can be applied or adapted for use elsewhere. There are plenty of good tools available for web-based collaboration and information sharing. It remains only for someone with the requisite knowledge and skills to show how they might be effectively combined and applied. In the coming months, I am also looking forward to shifting my attention back toward more creative work—writing articles and, perhaps, another book, while exploring new realms, physical, cultural, and spiritual. As I’ve said many times of late, I think society is going through a metamorphic change. It is something unprecedented, something that requires us to be responsible, creative and open to possibilities. It means a shift away from economic growth and the consumerist rat-race, toward a sustainable, steady state economy and a dignified life for all. Those who try to cling to the caterpillar economy are bound to be sorely disappointed. With sharing and cooperation we can make the transition to the “butterfly economy” both exciting and rewarding. This entry was posted in Developing Alternatives, My activities and tagged Economics of Peace, Interra, Michigan;s Future, newsletter, Salt Spring, speaking tour. Bookmark the permalink. I finally found this genuine author of intelligence I looked for. There are so many undiscovered topics about it and it is so difficultly to discover one answer resolution result solution that solve a problem problem . All answers are necessary I uncoverd in here. so much . Keep writing . This is indeed one of the most informative newsletters with great links to whats is going on in the north western part of the USA. BTW. If you happened to miss this good short piece of a flash presentation on money by Paul Grignon it is a must see!